UNITED NATIONS, Jan 19 2018 (IPS) - International organizations have criticized the United States’ decision to cut more than half of planned funding to a UN agency serving Palestinian refugees. This week, the U.S. administration announced that it is withholding 65 million dollars from a planned 125-million-dollar aid package for the UN Relief and Works Agency for Palestinian Refugees (UNRWA). UNRWA serves over 5 million refugees with education, healthcare, social services, and emergency assistance in the Middle Eastern region. As the U.S. was the agency’s biggest donor, contributing over 350 million dollars in 2017, UNRWA is now facing its biggest financial crisis. “At stake is the dignity and human security of millions of Palestine refugees in need of emergency food assistance and other support…at stake is the access of refugees to primary healthcare including pre-natal care and other life-saving services. At stake are the rights and dignity of an entire community,” said UNRWA Commissioner-General Pierre Krahenbuhl. “The reduced contribution also impacts regional security at a time when the Middle East faces multiples risks and threats, notably that of further radicalization,” he added. 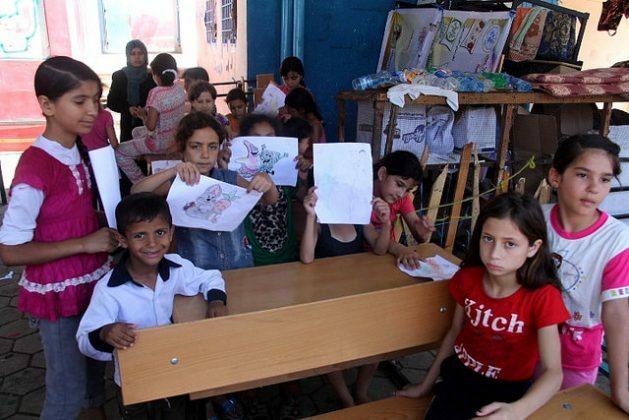 Former UN Undersecretary General and current Secretary-General of the Norwegian Refugee Council Jan Egeland noted that the funding cut will have devastating consequences for vulnerable Palestinian refugee children who depend on the agency for their education. “It will also deny their parents a social safety net that helps them to survive, and undermine the UN agency’s ability to respond in the event of another flare-up in the [Israeli-Palestinian] conflict,” he said. UNRWA provides education to over half of a million boys and girls in 700 schools and manages more than 9 million refugee patient visits at over 140 clinics. Human Rights Watch’s Deputy UN Director Akshaya Kumar noted that many Palestinian refugees live in poverty, including the majority of those in Syria who require humanitarian assistance to survive. “Unless other governments fill the gap soon, the U.S. cuts will jeopardize children’s schooling, vaccinations, and maternal health care for refugees,” she said. The Trump administration said that the decision was made as a way to press for unspecified reforms in the agency. Though the State Department spokesperson Heather Nauert said the move was not made to pressure Palestinians to enter negotiations, President Donald Trump suggested otherwise in a series of tweets just weeks before the decision. “We pay the Palestinians HUNDREDS OF MILLIONS OF DOLLARS a year and get no appreciation or respect…with the Palestinians no longer willing to talk peace, why should we make any of these massive future payments to them?” he tweeted. Kumar pointed out that UNRWA is an aid agency rather than a party to the peace process. “The administration seems intent on holding them hostage—and ultimately punishing vulnerable Palestinian refugees—as an indirect way to put pressure on the Palestinian Authority to join peace talks,” she said. “Taking away food and education from vulnerable refugees does not bring a lasting and comprehensive peace and [the] rights of Palestinian refugees will not be compromised by a financial decision,” he said. UNRWA has long been controversial since its establishment in 1949. Though it has evolved into a quasi-government, the agency was first set up to temporarily assist those who fled or were forced from their homes during the 1948 Arab-Israeli war. However, as the Israeli-Palestinian conflict continued, so did UNRWA’s existence. The agency allows refugee status to be passed down from generation to generation and does not remove people from its list who have gained citizenship elsewhere, contributing to an ever expanding population and questions as to who qualifies as a refugee. From the approximately 700,000 Palestinians who fled after the 1948 war, there are now over 5.2 million registered refugees in Syria, Jordan, Lebanon, and the Palestinian territories. While UNRWA has been criticized for not working to resettle refugees, Israel has not granted refugees the right to return and other countries such as Lebanon have largely denied Palestinians citizenship and access to employment or land. Even if the funding cut is meant to target Palestinian authorities, many note that vulnerable Palestinian refugees will bear the brunt of the impact as they will be left in a renewed state of limbo. UNRWA has since launched a global fundraising campaign to try to close its funding gap before it is forced to cut safety-net services. Donors have begun to step up including the Government of Belgium which pledged 23 million dollars to UNRWA soon after the move was announced. “For a lot of Palestinian refugees the UNRWA is the last life buoy,” said Belgian Deputy Prime Minister Alexander De Croo. “Let us draw our strength from the Palestine refugees who teach us every day that giving up is not an option. UNRWA will not give up either,” Krahenbuhl said. Jews have been “refugees” for 2000 years, and I was born in a DP camp in Germany right after the war to survivors who lost their whole families, including their first children to the murderous barbarism. We were waiting to go to Palestine, but the British and the Arabs stood in our way, so in 1949 we ended up in the US and were no longer considered refugees. How can millions of descendants from the 1948 war be considered as “refugees” 70 years after the fact? They live in Lebanon, Syria, the Gulf States, Latin America and many live in Jordan. How can they still be called refugees? Exiles, okay. I can understand that terminology, but refugees two to three generations later on? And the US and other counties must support them forever until they eliminate the Jewish state? I don’t think so. Trump is absolutely correct. It’s time to liquidate this farce and the Arab and Muslim states must give them permanent residency, working rights, and eventually citizenship. This inanity has gone on long enough. Far, far too long. The US should cut all funds to the UNRWA until the Palestinians sign and follow through a peace plan with Isreal. Then and only then would the US start issuing funds to the UNRWA, however these would be only partial funds. These funds would be partially issued once it could be verified that the Palestinians were honoring the peace treaty. If the Palestinians were to found violating the treaty then all funding would end permenately. Do not make the mistake that Obama made when giving Iran all the money up front. If the Palestinians do not want to sign a treaty, with Israel, then give Israel those funds and request that the UNRWA be closed by the UN permenately.